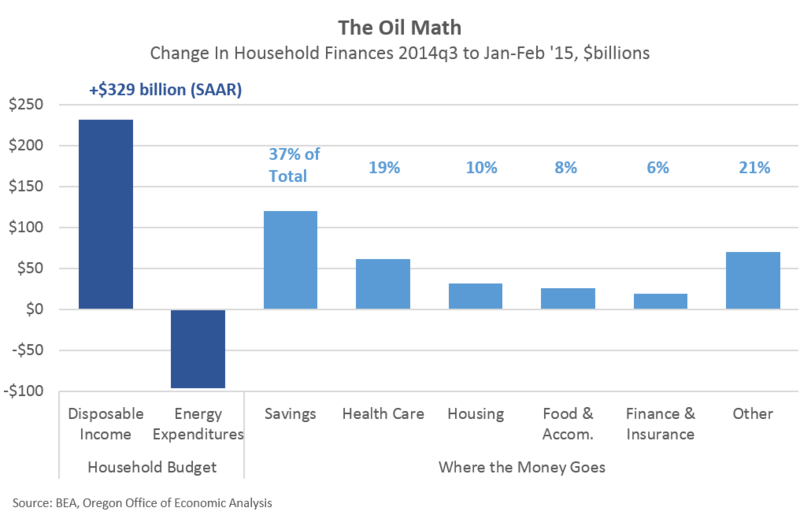 The plummeting price of oil was one of the biggest economic stories to end 2014 and for the 2015 outlook. Conventional wisdom was/is that the sharp fall in energy prices would act as the equivalent to a large tax cut, helping to stimulate the economy through increased consumer spending. Yes, some states would be net losers as they rely on energy producers, however, on net the U.S. would certainly benefit. So how is all of that going these days? First, the number of drilling rigs has fallen by nearly half in the past six months. Employment in oil-dependent metros is now growing slower than in the rest of the nation. Industrial capacity utilization for drilling activities and crude oil processing are declining, albeit from very high levels. All of this was/is to be expected and concentrated among a few regions of the country. However, on the flip side, it’s still a bit hard to tell where exactly these oil and energy savings are showing up in household budgets. However a few trends are emerging, even if we only have a few months worth of data to really work with. Over the past six months or so, households are saving nearly 40 percent of their disposable income gains and energy savings. They’re also spending more on necessities like health care and housing (as home prices and rents rise.) Another increase is seen in food services and accommodations. These early data readings suggest that households are largely saving more of their improved finances or spending on temporary items like going out to eat more or on vacation. 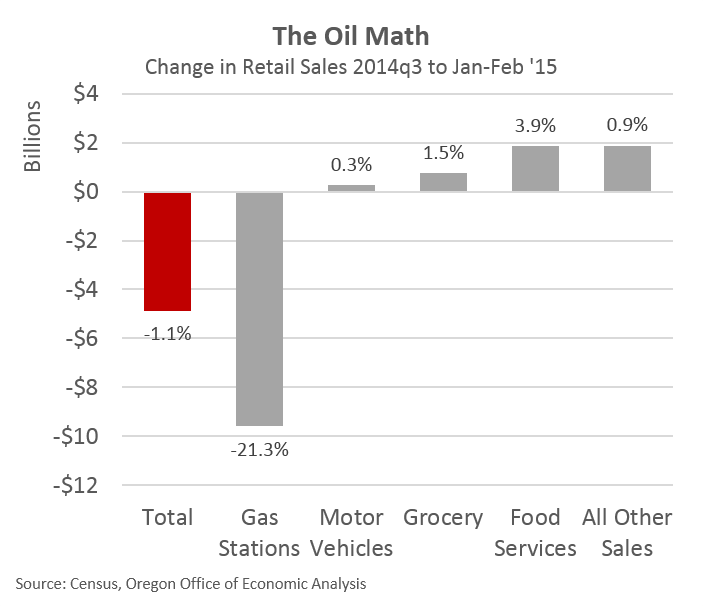 Another way to try and decompose where the energy savings are going is to look at the monthly retail sales figures. Overall these have been disappointing in recent months, with consumers only spending about half of their savings at the pump on other products. This means that the other half is being saved or spent on non-retail sales goods and services which are outside the scope of the data series. Here, however, one can clearly see the pick up in food services spending. All told much of the improvement in household finances is being saved, or spent on temporary splurges like going out to eat. Other data from the Fed also shows that household debt is increasing (auto and student loans, not credit cards) however not out of line with income gains, so the debt to income ratio is holding steady. It’s still relatively early in the data flow to see exactly how the energy savings are impacting the U.S. economy and of course we’ll have an even better idea with a few more months of data and revisions.